A few weeks ago, Tony Vecchi sat down with me, my old band Lights, and our friend Charles Murphy to talk about New Song from our forthcoming album Something in the Sky, a collection of material that we never recorded/released when we were a band from 2003-2007. 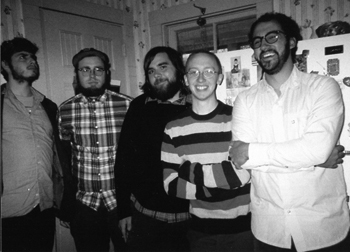 A few weeks after we played our last show in Fall 2007, we decided to get together to record this large batch songs. The bulk of the tracking was done live by Charles in a weekend at Andy’s grandparents’ house in Gardner, MA. After a couple of years of additional work, mixed feelings and premature announcements, we finally have Something in the Sky. It was fun to get together and do this interview, we had a lot of laughs. I must apologize – my mic on this one is low in the mix and it sounds like I’m in an adjacent bathroom, which (to me at least) somehow adds to the humor of it all… I tried to fix it a bit, but my suggestion if you have trouble with the levels on this one: turn it up. Otherwise, the interview went really well. We discuss this song, our songwriting in general, the recording process, all that fun stuff.